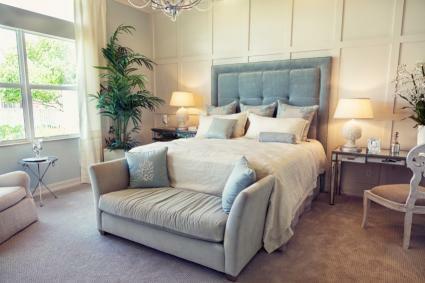 A guest bedroom should be inviting and comfortable like the other bedrooms in your home. 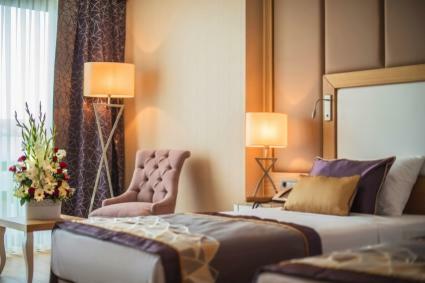 There are many details you can add to ensure your guests have a pleasant stay, such as furniture, boutique bedding and luxurious small touches. When designing a guest bedroom, it helps to put yourself in the place of those who will be visiting and depending on your forethought to meet their needs. Decide on a color scheme and theme, then start with major selections. Needless to say, window, wall and floor treatments are essential to creating the perfect guest room design. Walls: Paint, wallpaper, stencil or add decals to create a more welcoming and even dramatic room decor. A floor mirror is always appreciated when getting dressed. Area rugs: You can always add an area rug to a carpeted bedroom. Use a protective pad underneath the rug to reduce the wear on the carpeting underneath. Hardwood floors: White wash floors, create distressed look, and stencil a center medallion and border. Add an area rug or two. Bedside rugs: Opt for smaller rugs on both sides of the bed so guests will be greeted by a plush softness beneath their feet upon rising. Window treatments: Provide adjustable window treatments, such as mini blinds, up and down shades or sheers. Draperies or curtains: Guests will appreciate room darkening curtains. Use tie backs and valances to dress up drab windows. Go with rope and tassel tiebacks for a greater luxurious appeal. Upcycle furniture: Paint the headboard and footboard, dresser, and end tables the same color. Headboard new look: Upholster the headboard for a chic new look. 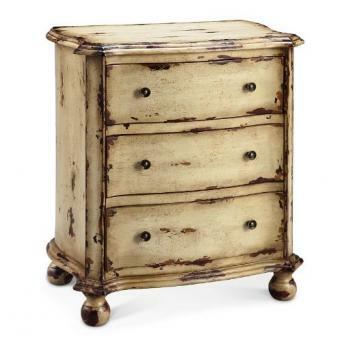 Specific look: Use chalk paint for furniture or give a distressed look with a stain kit. Stencil: Add a classic stenciling to the headboard and footboard, drawer facing and on the back of a rocking chair. Bed treatment: Dress up beds with bed curtains or a crown canopy. Changing station: Set a velvet tufted bench at the foot of the bed for suitcases or sitting to change shoes. Writing desk/table and chair: Guests can use for a desk or dressing table. Place a decorative pen/pencil holder, nice stationery for those who enjoy the art of letter writing, a two-sided mirror on a stand, tissues and cotton balls in a jar. Just as many guest bedrooms are the recipients of cast-off furniture, they are also the dumping ground for old bedding. An old mattress, discarded comforter, blanket, sheets, and even pillows are relegated to the guest bedroom. These tired items do little to make guests feel special and welcome. Allocate a budget just for purchasing quality bedding for the guest bedroom. Shop around and find steep discounts for high-quality bedding. Mattress: If you can't afford a new mattress for the guest bed, invest in a quality topper or mattress pad to improve the mattress quality. Pillows: Go for feather alternative pillows since some people are allergic to down. 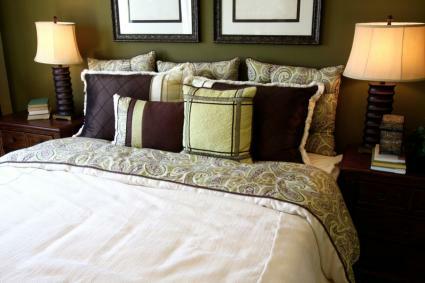 Pillow covers: A pillow cover is a must for any pillows, especially those in the guest room. This barrier protects the pillow and your guests. Comforters and duvets: Boutique bedding is a great way to maximize your dollars and give a designer look. Sheet sets: Purchase more than one set of sheets so you always have nice sheets and pillowcases for your guests. Decorative throw pillows: Use velvets, silks and other tactile friendly fabrics for decorative throw pillows. Make sure the inserts are equally luxurious to provide quality support. 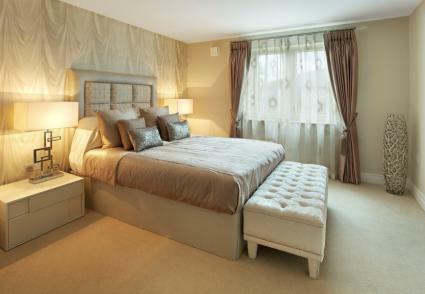 The lighting in a bedroom can make or break the ambient feeling you want to create. By layering lighting, you can create greater depth and a coziness to your guest bedroom. Wall sconces: Select an appropriate style to instal above each end of a dresser to frame a mirror. Mini-chandeliers or pendant lighting: Depending on the overall style, you can use either a mini-crystal chandelier or pendant light above each night stand. Table lamps: A table lamp on each night stand can be used instead of suspended lighting. For a cozier feel, opt for a gold, tan, or colored lamp shade. Overhead lighting: Select either a chandelier style or flush ceiling style light fixture. Recessed lighting: Another great layer of lighting includes recessed pot lights placed on a dimmer switch. Locate these along the parameter of the bedroom. Candlestick lamps: This style of lamp can be used on a dresser or console table. Floor lamps: Use a torchiere to reflect light onto the ceiling for a special subtle lighting. Direct lighting floor lamps can be used if you have a seating area in the room. Reading lamps: Add a small adjustable reading lamp by each side of the bed. Once you have your guest room essentials established, there are several niceties you can add to make this bedroom perfect. Some guests might be night owls and not ready to retire when the family does. You can accommodate their personal habits with a few choice selections. A TV with a pair of wireless headsets will let guests watch TV without fearing they'll disturb the rest of the household. 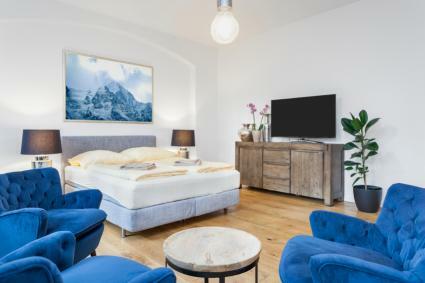 A pair of comfortable chairs for TV viewing or a chaise lounge for reading or tablet use are ideal, but for a smaller room, bed-rests are a great choice. A small table with chairs, with enough room, also provides a place for guests to visit after the rest of the household has retired. Provide guests with a supply of midnight snack foods and drinks. Add a dorm-size under the counter refrigerator set in a closet. If there's no room, then send guests to their room with a full ice bucket or cooler filled with bottled water and drinks. For the summer months, provide a small oscillating fan in case they're uncomfortable with your thermostat settings. A small ceramic heater is ideal for cooler months. Add a few extra pillows, throws, and blankets in the closet. Set-up a coffee and tea station on a console table or small chest. Include a coffee machine and a tray filled with few small baskets of coffees and tea bags, and sugar, sweeteners and creamers. Don't forget to include a pair of mugs or teacups. A decorative tissue box holder with a full box of tissues can be placed on one of the nightstands. 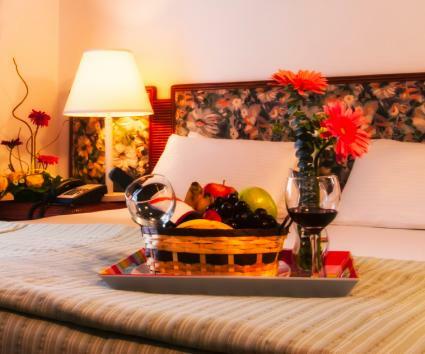 Place a couple of decorative trash cans by the bed and by the writing table or door. Create a charging station with a floating shelf so guests can recharge their cellphones, tablets, and computers easily. You need to accessories your bedroom design the same way you would any other bedroom in your home. Avoid placing family photos in this room. Instead, place framed scenic photos and paintings. Add decorative objects that go with your theme and décor. A floral arrangement can be placed on a dresser and nightstand to add color and texture. A basket of toiletries placed on the dresser can be filled with milled soaps, mouthwash, toothpaste, and tooth brushes is a nice gesture. Put together a welcoming basket of fruit, gourmet cheeses, and meats or confectioners make nice guest gifts. Depending on your budget, you may need to prioritize purchases and breakdown your design into stages. Once your project is complete, test it out on a few guests. You may end up with more frequent visits.